Old Aker Church (Norwegian): Gamle Aker kirke) is a medieval church located in Oslo. It is a Roman basilica built from limestone. The church is the oldest existing building in Oslo, and was erected by king Olav Kyrre in 1080 as a church for all of Vingulmark. The grounds of Old Aker Church were likely the place of the regional thing. 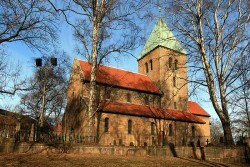 The church sits on top of the Telthusbakken hill, and is located centrally in the borough of St.Hanshaugen. Most of the buildings in the area are from the 1880s, with the addition of some apartment blocks from the 1930s. The church was built over an old silver mine, Akersberg that was in use since the early Viking ages. The mines are mentioned in the 1170 Historia Norvegiae. fra The mines must have been the inspiration for a number of stories about the church having hidden silver treasures and even dungeons with dragons.